European fan palm (Chamaerops humilis): growing, planting, caring. One of the most cold-hardy palms! 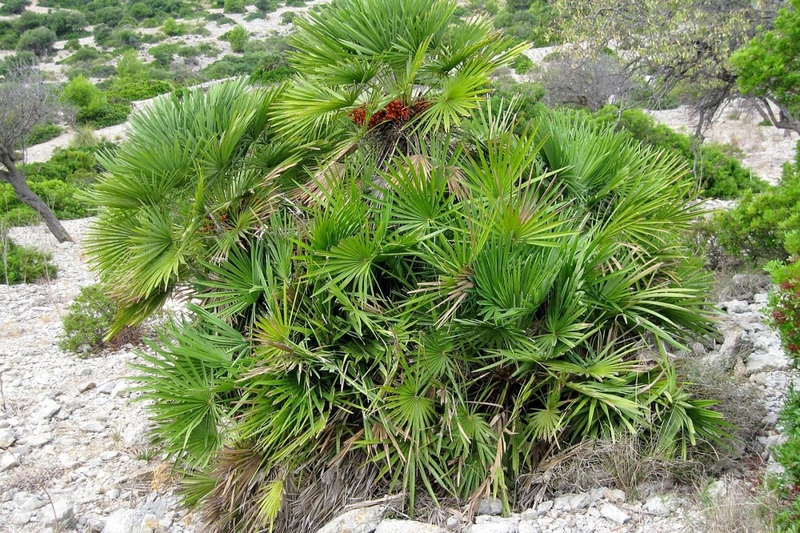 Chamaerops humilis - the European fan palm or the Mediterranean dwarf palm - is a shrub-like clumping palm, with several stems growing from a single base, often tightly together, eventually reaching 2–5 m (10–20 ft) tall. It is valued in gardening and landscaping in many parts of the world. It is very drought-tolerant once established, and most species are hardy to −12 °C (10 °F). In open soil, plant in spring in a spot sheltered from the wind, warm, drained, fresh, rich, in semi shade. Dig a hole three times the size of the root ball, and plant without burying the base of the stem. Tamp the soil well while you put it back in the hole. Do not mix the soil layers. Water with at least two watering cans. In pots, plant in loam mixed with potting soil, and put gravel at the bottom of the tank for good drainage. Choose a pot as large as possible. Sow in the spring at 19 to 24 ° C - and if possible soak the seeds for 24 hours before. Every two or three years, repot your palm tree, cut 1/3 of the roots, and replace 1/3 of the soil. If it is too big to be handled you can replace the top layer of soil with new potting soil, or some compost on about ten centimeters. Water the palms the first year after planting, and also if yours is potted, as soon as the soil has dried since the previous watering, without ever soaking them. Always water with water at room temperature: the palm tree does not appreciate cold water! Cut off the dry leaves. Keep your potted palm trees sheltered from frost by bringing them inside, near a window but protecting them from the sun. In April-May, take out your pots sheltered for the winter and place them in a place sheltered from the winds. The butterfly larva Paysandisia archon is currently active in the south of France, and digs galleries in the plant. Cut and burn, or use a treatment with nematode Steinernema carpocapsae, as a preventive, between March and November.